Most of us are familiar with the educational program of the day: Sesame Street. Thanks to MakerBot, this educational program is continuing to make an appearance in our lives. MakerBot has launched an online digital store where you will soon be able to print any of your favorite Sesame Street characters. For now, it is possible to print Big Bird’s best friend, Mr. Snuffleupagus. MakerBot says additional characters will be available to print in the following months. 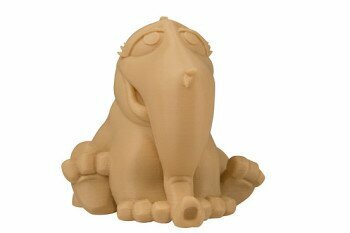 The 3D printable models of Mr. Snuffleupagus, and eventually his friends, are available for download for $1.29. Mr. Snuffleupagus will make his first appearance at the Bay Area Maker Faire in San Mateo, California May 17 and 18 at the MakerBot booth. Attendees are encouraged to keep their eyes out for the 3D printed Snuffleupagus figurines which will be hidden throughout the center. Contestants who upload their photos to Twitter or Instagram and tag them with #SnuffySelfie will be entered to win a MakerBot Replicator 2 Desktop 3D Printer, plus MakerBot Digital Store content, filament, and some select Sesame Street merchandise.